When we offer rings with stones, we prefer to offer products where the main stone is of natural origin. We will disclose if the main stone is not of natural origin. As a cost consideration some of the rings are trimmed with CZ,(cubic zirconium), as one small diamond would sell for as much, or more than the ring. At present we are also offering several rings with CZ,(cubic zirconium) which is plainly disclosed. We try to give truth disclosure of the sizes of the main stones in our rings. The stones are measures as best as possible, as the stones are already mounted into the rings when received. We cannot give the weight of the stones, as stones with the same face size can be cut in very different manners, resulting in different weights. It is our company policy to act in a very straight forward manner. We sell rings made of precious metal, silver, also know as sterling silver. The sterling silver is real. We would not sell a ring that is made of base metal and plated unless it was clearly disclosed in the product description on the shopping cart page. However, there are some processes in which real silver is coated with another metal to enhance it’s appearance. This would also be fully disclosed. At present all rings offered are solid sterling silver, some do have rhodium plating for tarnish resistance. Foundation Jewellery sells its products directly to the public. Subject to clerical error all items on our web site are available for shipment. We will not substitute sizes, or items. If we error in listing an item for sale, that is out of stock you will be promptly notified. If your credit card has been charged, the charge will be promptly refunded. We do not back order rings as there is a considerable time lag from when we place orders until they are received. 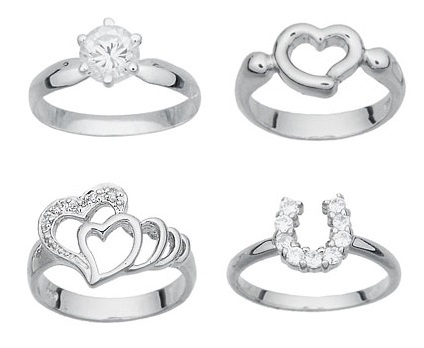 At the present time we are stocking rings in sizes 6, 7, 8 and some size 9 rings. If you wish to return any unworn retail purchase within twenty days of receipt we will refund your full purchase price. Worn or altered items will not be accepted for return. We do not pay return postage unless there is a shipping error or defective product.